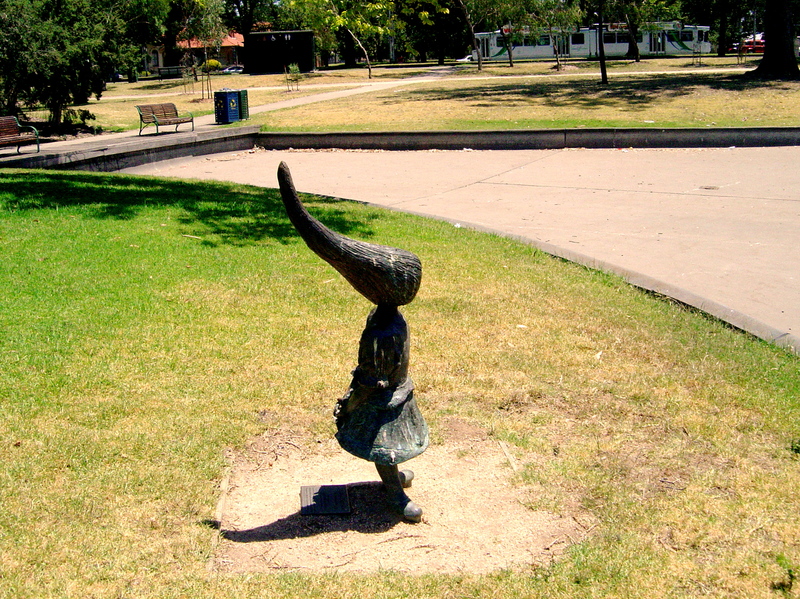 In 2010 thieves stole Loretta Quinn’s sculpture “Within Three Worlds” from Princess Park stolen using an angle grinder to cut the bronze statue off at its feet. Now, in 2011, new edition of the statue has been cast and it has now been installed in its original location. The new version of “Within Three Worlds” is different from the original, almost completely different but the three boats in the pond are still original. The new statue is better than the original, it is less clunky, the shoes, hands and dress are more detailed and the hair curves more elegantly. Most obvious difference is that the new statue has a green finish on the dress and shoes. It has also been moved a metre closer to the pond. Stolen public sculpture in Melbourne receives little attention, as Melbourne’s public is more interested in an art scandal than an art theft. The bronze dog, “Larry LaTrobe” was stolen from the city square in 1995. The current “Larry LaTrobe” is another edition courtesy of Peter Kolliner, the owner of the foundry where the original was cast. The regular theft of the hammer from “The Pathfinder” by John Robinson, 1974 in the Queen Victoria Gardens required that the replacement be unscrewed every night. The recurring theft of the hammer from the statue became such a problem that the hammer is now rarely installed (or has the replacement been stolen?). None of these stolen statues have been recovered; it is unfortunate but these bronze sculptures were probably stolen for the scrap metal. This was probably the fate of the 1m metal statue of Christ stolen from a Templestowe Church in August 2010 reported in Manningham Leader. 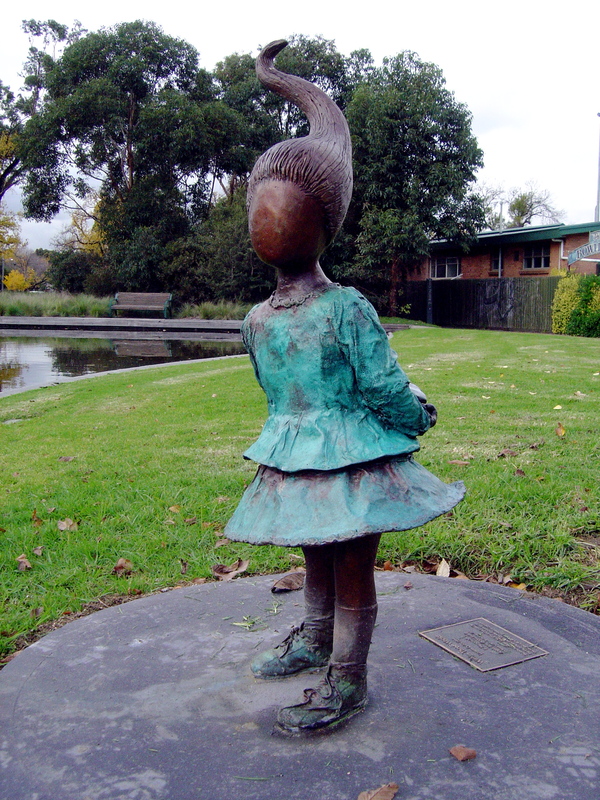 The only stolen public sculpture that has been recovered is “the boy with the turtle” (artist unknown c.1850) that was stolen in 1977 from Fitzroy Gardens and recovered two and a half years later abandoned in a Richmond carpark. It was saved because it is only made of cement and cement has little intrinsic value. An English fantasy illustrator told me that he’d returned home to find that his flat was being burgled. The two burglars bailed him up and asked if he’d done the art; he told them it was his and they complimented him on his art and left taking nothing. The Marius-Jacob gang went even further on discovering that they had broken into the house of a French poet they left money to replace the pane of glass that they had broken. Robbing artists or stealing public sculpture for scrap metal lacks any dignity as a crime, like stealing from charity bins.